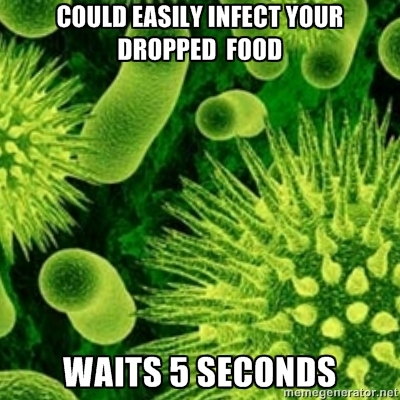 Possible Post Titles: Why The 5 Second Rule is Not Infallible. Or, Don’t Eat Stuff Off the Floor. I’d like to share the following conversation, in the interests of educating the public on important food safety issues. Me: Well, I guess I shouldn’t eat stuff that falls on the floor. Husband: You’re just figuring this out? Me: I dropped a chocolate-covered blueberry. I leaned under my desk, picked it up, blew on it, popped it in my mouth and suddenly realized it had turned into a chocolate-covered espresso bean. The whole thing was either magical or really gross. And yes, I broke an almost month-long blog silence just to post this little gem. You’re welcome. ← Writers: Should you be blogging? Maybe not.